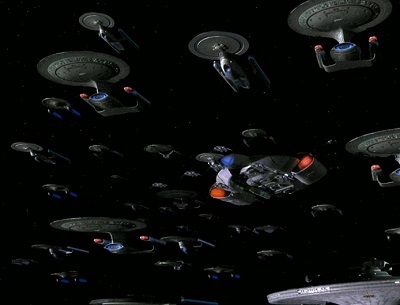 The 16th Fleet is a rapid response fleet in the Federation Starfleet. Created in the 23rd century, the 16th Fleet is a mobile fleet within Starfleet focused on preserving the Federation and its ideals in the face of adversity. The 16th Fleet's duties are primarily exploratory in nature; however, the members of this fleet are also assigned to rapidly respond to diplomacy and emergency support missions on the Federation's Outer Rim, including the borders with the Cardassian Union, Klingon Empire, and Romulan Star Empire. With recent advancements in technology allowing Starfleet the ability to travel to the far reaches of the Delta Quadrant and the Dominion lessening restrictions on admission to the Gamma Quadrant, the vessels of the 16th Fleet have been selected to serve in these regions as well. These personnel are tasked with achieving peace through a mix of diplomacy, military force, and intelligence gathering. In the event of a violation of the Federation Charter by a member state or a disagreement between Federation members the ships of the 16th Fleet will be called in to respond. For this reason the Captains and crews of vessels assigned to the 16th Fleet are intensely loyal to the Federation and, traditionally, those who are selected to serve as its leaders will renounce citizenship on their home world. Despite the intense nature of their missions, selection for the 16th Fleet is considered one of the highest honors that can be bestowed by Starfleet. In 2001, as many groups started to focus more and more on the quantity of their games and were becoming less and less interested in producing quality stories, the 16th Fleet was created by a group of friends who wanted to explore the Star Trek Universe in a friendly and safe environment. Originally starting out on the TrekBBS, the group moved to its current home on Yahoo Groups in early 2002. Over the years we have seen many great games and we've made countless friends; many of whom have been with us since our earliest days. Containing players from throughout the world, the 16th Fleet is a 100% player dedicated Role Playing Game focusing on Play By E-Mail Games. Our players are all seen as equals - with no one person elevated above anyone else. Each participant is actively encouraged to have an active voice in the decisions made by our group. Each game has its own dedicated team of moderators who work together to keep everyone involved and playing. Our moderators have an open door policy with our players and we are always willing to listen to and help anyone who is a member of our game and to listen to their suggestions on ways upon which we might improve ourselves. All of our leaders are selected from in house with our moderators being decided upon by dedication to our players, participation, and their promotion of our game’s overall goals. Most importantly though we understand that life does get in the way and we actively promote our players taking a look around every now and then and to see our story as a diversion from their daily lives.